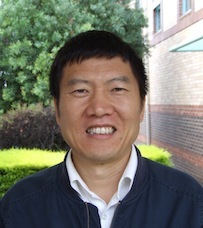 Zuocheng Zhang is a member of the English, Literacies and Languages Education team (ELLE) within the School of Education and the Languages, Literacies and Literature Research network. I am interested in Business English, language, discourse and identity, multimodality, and TESOL education. My current research focuses on how teachers and students of language and literacy make sense of disciplinary literacies, ESP teacher development, and discourses of diversity and inclusivity in international student education. Team: Blass, E., Chan, E., Feez, S., Clary, D., Zhang, Z. C., Morgan, A.-M., & Hathaway, T.
Jennyfer Townsend, Doctor of Philosophy thesis titled “The relationship between ESL teachers’ language learning experiences, their cognitions about ESL teaching and learning, and actual classroom practices”, Supervisors: Zuocheng Zhang, Terry Sullivan. Shannon Baker, Master of Education (Research) thesis titled “Second language learning and identity: Using social interaction as a framework for creating a new identity to help acquire a second language for learners of Chinese”, Supervisors: Zuocheng Zhang, Vegnes Maniam. Ingrid Wijeyewardene, Doctor of Philosophy thesis titled “Rhetorical and represented agency in Thai political science texts on the 2006 coup d'état", Supervisors: Zuocheng Zhang, Mary Macken-Horarik. Gaby Benthien, Doctor of Education thesis titled “Study abroad, L2 motivation and English language acquisition: A longitudinal study of the experience of Japanese university students studying English abroad and at home”, Supervisors: Susan Feez, Zuocheng Zhang, Ruth Nicholls. Wai Sa Ip, Doctor of Education thesis titled “University students’ beliefs about English learning and their use of learning strategies: A mixed-method study in Macao”, Supervisors: Susan Feez, Zuocheng Zhang, Thu Ngo. Zhang, Z. C., & Sun, Y. (2018). Teaching business vocabulary. In J. I. Liontas (Ed. ), The TESOL encyclopedia of English language teaching. Oxford: Wiley-Blackwell. Feez, S., & Zhang, Z. C. (2018). Learning genres. In A. Burns, & J. Richards (Eds. ), The Cambridge guide to learning English as a second language (pp. 233-241). Cambridge: Cambridge University Press. Zhang, Z. C. (2017). Learning Business English in China: The construction of professional identity. London: Palgrave Macmillan. Zhang, Z. C., & Chan, E. (2017). Editorial: Current research and practice in teaching disciplinary literacies. ESP Today, 5(2), 132-147. Zhang, Z. C., & Chan, E. (2017). Current research and practice in teaching disciplinary literacies (guest-edited special issue of ESP Today journal). Chan, E., & Zhang, Z. C. (2017). Teaching reading through multimodal texts. In H. P. Widodo, A. Wood, & D. Gupta (Eds. ), Asian English language classrooms: Where theory and practice meet (pp. 49-70). London: Routledge. Zhang, Z. C. (2016). “Somewhere in the middle is the optimal balance”: A subject specialist negotiating business and language in teaching business writing. ESP Today, 4(2), 145-164. Zhang, Z. C. (2015). The new and the familiar in digital business discourse. Erika Darics (Ed. ), Digital business discourse. London: Palgrave Macmillan, 2015. ESP Today, 3(2), 247-251. Zhang, Z. C., & Guo, Y. Y. (2015). Linguistic choices in the Chinese workplace: A language ecology perspective. In L. Tsung, & W. Wang (Eds. ), Contemporary Chinese discourse and social practice in China (pp. 163-184). Amsterdam: John Benjamins. Zhang, Z. C. (2015). Disagreements in plenary addresses as multimodal action. In B.C. Camiciottoli, & I. Fortanet-Gómez (Eds. ), Multimodal analysis in academic settings: From research to teaching (pp. 17-38). London: Routledge. Zhang, Z. C. (2015). Unpacking professional identities for Business English students. In D. Djenar, A. Mahboob, & K. Cruickshank (Eds. ), Language and identity across modes of communication (pp. 291-311). Boston, MA: Walter de Gruyter. Zhang, Z. C., & Li, Y. X. (2014). Sarah Benesch, Considering emotions in critical English language teaching: Theories and praxis. London: Routledge, 2012. Australian Review of Applied Linguistics, 37 (1), 69-71. Zhang, Z. C., Xing, J. Y., Wang, Y., Zhu, M. H., Sun, J. Q., & Liu, J. X. (2014). duomotai jixihuayu yanjiu (Multimodal study of situated discourses). Guangzhou: World Publishing Corporation. Zhang, Z. C., & Li, S. (2014). Negotiating membership in employment interviews at a Chinese media institution. International Journal of Business Communication, 51 (1), 9-30. Zhang, Z. C. (2013). Identities in needs analysis for Business English students. ESP Today, 1, 26-44. Zhang, Z. C., & Cruickshank, K. (2013). Andrew McKinlay and Chris McVittie, Identities in context: Individuals and discourse in action. Oxford: Wiley-Blackwell, 2011. Discourse & Communication, 7, 361-363. Zhang, Z. C. (2013). Teaching Business English. In C. A. Chapelle (Ed. ), The encyclopedia of applied linguistics. Oxford: Wiley-Blackwell. Bargiela-Chiappini, F., & Zhang, Z. C. (2013). Business English. In B. Paltridge, & S. Starfield (Eds. ), The handbook of English for specific purposes (pp. 193-211). Oxford: Wiley-Blackwell. Zhang, Z. C. (2013). Business English students learning to write for international business: What do international business practitioners have to say about their texts? English for Specific Purposes, 32, 144-156.